8 out of 10 people still think that Autopilots are a computer system which are capable of driving the vehicles on their own ! Well that is completely wrong ! Rather than just correcting them, let us all know what is actually are autopilot system & everything else related to it ! What is an Autopilot ? An autopilot is a system which is used to control the path/trajectory of the vehicle without constant “hands-on” control by a human operator being required. Autopilot is sometimes informally called as “George” by pilots & the crew members ! Sperry Corporation developed the first autopilot in 1912. The autopilot was connected to gyroscopic head indicator & attitude indicator(artificial horizon) to be hydraulically operated by elevators & rudder. Lawrence Sperry, son of a famous inventor Elmer Sperry demonstrated this in Paris Aviation Safety contest in 1914. Why do we need Autopilot ? Early airplanes took flight for short distances & pilot had no problems to give attention & operate it for couple of minutes or few hours. But along with time as there was development in the field of aviation, there was an increment in engine’s efficiency, more powerful engines resulting into greater range of aircraft. This meant that the pilot had to give his full attention to flight controls to a prolonged period leading to serious fatigue. Hence there was a need of an assistant-a system which could help pilot operating the aircraft. Autopilots are used in aircrafts, missiles, ships & also in spacecrafts. Generally autopilots are associated with aircrafts so here in this article we will focus on system related to aircrafts. Autopilot system OR Automatic Flight Control System(AFCS) is a part of avionics of an aircraft. Avionics include navigation, communications, display of multiple systems & hundreds of other systems fitted on the plane. The International aviation regulations has made it mandatory to install autopilots in aircraft with more than 20 seats. The 3 basic control surfaces or parts which help in maneuvering airplanes are: elevators, rudders & ailerons. Elevators– as name suggests, it helps in elevating & lowering the plane. Elevators are located on tail of the plane beside the rudder. Rudders– helps in steering the plane sideways(also called yawing). 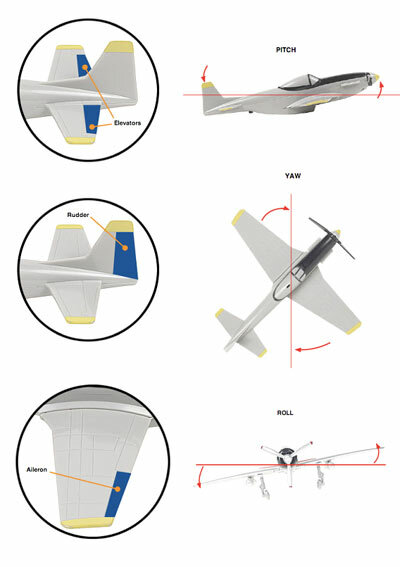 Ailerons– help in rolling of the plane & are located on the rear edge of the wings. 3 axes of rotation ! Single-axis autopilots controls the aircraft in roll axis only with the help of ailerons aka “wing levelers”. Two-axis autopilots can control an aircraft in pitch axis as well as roll axis with the help of ailerons & elevators. The three-axis autopilot systems are capable of controlling an aircraft in all the 3 axes- roll, pitch & yaw with the help of all three – ailerons, elevators & rudder. How do autopilot systems work ? Early systems were just single axis autopilots & used a gyroscope to get inputs. Today’s autopilots get the inputs from the dozens of sensors located in different parts of plane(accelerometer, pressure sensor & various guages). As a refrigerator OR an air conditioner OR a heater is able to maintain the temperature of the room, similarly AFCS is able to maintain/control the trajectory/path of the flight. Lets exactly know how does an AC maintains the temperature of room. 1. A persons sets the temperature on his AC he desires to be the room temperature. 2. The thermostat of the AC compares the room temperature with the input temperature(set by the user). 3. The conditioner cools the room until the room temperature is equal to the input temperature. 4. As soon as the room temperature is equal to the input, thermostat sends a signal a microcontroller & the AC is turned off. 5. When the room temperature exceeds the input temp. the thermostat again sends a signal which turns on the AC. AFCS work the same way; instead of just one sensor, airplane controls dozens of sensors with help of servo motors & links. Let us consider a case in which the pilot wants to fly at a constant height in the same direction keeping the speed constant. Block diagram of auto pilot system ! 1. The pilot sets a value for wings to maintain the position of the flight. 3. Position sensors or gyroscopes notes down the change & sends to the computer system. 4. The computer compares the input value with the new value recorded by the sensors. 5. The computer sends a signal which turns the servo motors(also called ‘servos’) on. 7. As soon as the values get equal, it again sends a signal to servos to turn it off. In simple words, if the aircraft dips 5 metres, the ailerons will adjust their angles & gain a height of 5 metres so that the height remains constant during the flight ! Some AFCS use design diversity. In this feature, the software process is not only run on multiple computers but also by using different architecture on different computer. Not only programmed by different programming languages but also each computer will run software created by different engineering teams. It is highly unlikely that different teams will make the same mistakes. Modern autopilots have evolved so significantly that they can not only execute a flight plan but also are capable of performing automated landings UNDER THE SUPERVISION OF A PILOT.